This handout photo from the S. Korean Unification Ministry shows the S. Korean president's national security adviser, Kim Kwan-Jin (R), and Unification Minister Hong Yong-Pyo (2nd R) shaking hands with the N. Korean officials during their meeting, Aug. 22, 2015. North and South Korean officials resumed marathon talks late Sunday afternoon in an urgent bid to avert war on the peninsula. Initial talks that began Saturday were adjourned 10 hours later in the early hours of Sunday. Officials have not publicly commented on the discussions, and there is no word on whether the negotiations are making any progress, or how long they would continue. The high-level meetings are taking place at the Panmunjom truce village despite a deadline set by Pyongyang, which had threatened military action unless Seoul ended propaganda broadcasts into the communist North and removed banks of loudspeakers it has installed along the border. The deadline passed without incident - and without the loudspeakers' removal - and the talks began 90 minutes later, at 6 p.m. (local time). In Washington, White House officials said President Barack Obama has been kept up-to-date on the situation in the Korean Peninsula. "As the State Department has said," a spokesman commented, "we remain steadfast in our commitment to our alliance with South Korea, with whom we will continue to coordinate closely." Even without concrete results, analysts say the marathon session has delayed any further military activity and given the two Koreas added time to look for a peaceful end to the current crisis. South Korean President Park Geun-hye's National Security Adviser Kim Kwan-jin and Unification Minister Hong Yong-pyo met with their North Korean counterparts at Panmunjom in the demilitarized zone, or DMZ, separating the two countries. North Korea’s representatives are Hwang Pyong So, a top official in the Korean People’s Army who is considered to be the country's second most powerful figure after leader Kim Jong Un, and Kim Kyou Hyun, who is in charge of inter-Korean relations for the North. South Korea’s Foreign Ministry has said it will not end its cross-border audio broadcasts into the North until Pyongyang takes responsibility for recent attacks, punishes those responsible and takes action to prevent further provocations. South Korean army's armored vehicles move in Yeoncheon, south of the demilitarized zone that divides the two Koreas, Aug. 22, 2015. Despite the high level dialogue, the potential for escalation or miscalculation remains, since both sides are in a state of maximum defense preparedness, ready for the possibility of a major military confrontation. A landmine explosion in the DMZ that wounded two South Korean soldiers on August 4 triggered the current crisis. Seoul accused Pyongyang of planting the explosive devices and restarted cross-border broadcasts denouncing North Korea for the first time in over 10 years. On Thursday the North attacked a loudspeaker tower in the DMZ with artillery shells, and the South responded with multiple rounds of artillery fire. No damages or casualties were reported, and the North has disclaimed any involvement in either incident. However, North Korean leader Kim Jong Un subsequently increased his nation’s military readiness, declared frontline areas to be in a "quasi-state of war," and set a 48-hour deadline for military action unless South Korea capitulated to the North's demands. "Our military and people are prepared to risk an all-out war, North Korea's Foreign Ministry announced Saturday, "not just to simply respond or retaliate, but to defend the system our people chose." 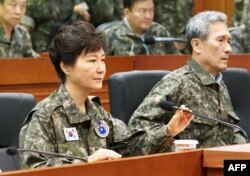 President Park Geun-hye met with her National Security Council and also increased South Korea’s defense posture. 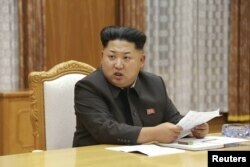 "We are closely monitoring the situation," presidential spokesman Min Kyung-wook said Saturday. "We are ready to strongly respond to any North Korean provocations." The two countries have technically been at war since their 1950s conflict, which never officially ended in a peace treaty. North Korean leader Kim Jong Un speaks at an emergency meeting of the Workers' Party of Korea (WPK) Central Military Commission in Pyongyang, in this undated photo released by North Korea's Korean Central News Agency (KCNA), Aug. 21, 2015. 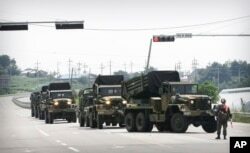 South Korea’s defense ministry said Saturday its policy is to respond proportionally to any North Korean provocation so as to demonstrate resolve and deterrence without escalating the conflict. Seoul has 11 loudspeaker towers stationed across the long inter-Korean border. They operate for about 10 hours a day, broadcasting what the South Korean Defense Ministry says is not anti-Pyongyang propaganda, but a mix of fact-based news about the Korean peninsula and the world, weather and popular music. In another gesture underscoring the current level of tensions eight South Korean and American fighter jets conducted simulated bombing runs Saturday over South Korean territory as a "show of force" against Pyongyang's threats. Earlier Saturday, North Korea deployed additional weapons near the flashpoint border in preparation for a possible strike, according to the Yonhap news agency. U.S. defense officials say annual drills by American and South Korean military forces were halted temporarily Thursday after the exchange of artillery fire but have since resumed. This handout photo released by the presidential Blue House shows South Korea's President Park Geun-Hye (L) during her visit to the headquarters of Third Army in Yongin, south of Seoul, on August 21, 2015. Saturday’s emergency meeting was the first high-level inter-Korean dialogue since February of 2014. An emergency meeting in response to a forced crisis underlines a pattern of diplomatic behavior employed by past North Korean leaders Kim Il Sung and his son Kim Jong Il, who often used provocations and threats to try to extract concessions and aid. During this crisis there has been concern that the young and inexperienced Kim Jong Un would not have the diplomatic skills to engage in such a game of brinksmanship, or a sufficiently firm hold on power to be able to compromise when necessary. Seoul has also been less willing to offer concessions to Pyongyang under President Park, and its military has been under orders to respond with force, ever since a North Korean artillery attack in 2010 caught the South by surprise and killed four people. The United Nations, the United States and even the North's key ally, China, have called for calm to reduce the high tensions and potential for further conflict. Youmi Kim in Seoul contributed to this report.